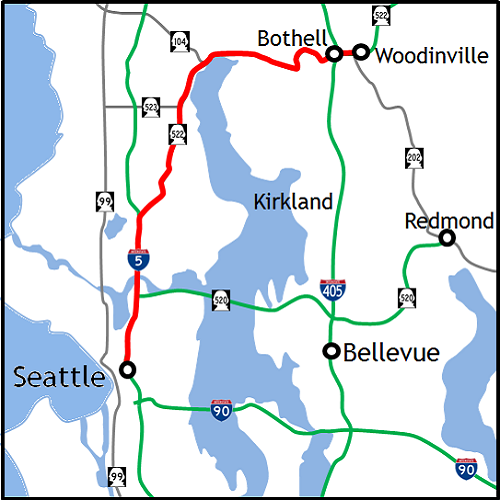 The route extends 15.6 miles between the University St exit on I-5 in downtown Seattle and SR 522 at SR 202 in Woodinville. View today's average and current travel times for this and other Seattle Area commutes. Weekends are generally less congested. Average travel time is typically the same as a trip taken on a weekday during non-peak hours. We recommend using the archived traffic maps if you are planning a future trip. By viewing a number of archived maps, you can develop a feel for the variety of traffic conditions you might encounter. WSDOT is working to improve safety and decrease congestion on I-5. For details, view the I-5 construction project. As roads are improved, you may experience increases in commute times due to the construction.